It’s easy in today’s computer-centric world to take for granted the flexibility and creative power the average person has when preparing written documents. Aside from the apparently endless selection of typeface options that are somewhat erroneously referred to as fonts, there’s also a large number of special characters that can be easily accessed and printed. Contemporary writers are spoiled for choice – ironically, that’s something that can easily turn out to be a detriment – and those too young to remember the typewriter as the mainstay of mass communication often find it amusing that previous generations were hamstrung by such lowly machines. It’s true that type writers (the people, not the machines) were limited to what had been fitted to their typewriter by its manufacturer; in other words, they only had a single typeface and a very limited number of special characters to work with. By today’s standards it may seem to be an obvious constraint, but despite this limitation typewriters produced good-looking, highly legible documents, and those using them managed just fine with the tools at hand. In terms of typeface and character choice, the typewriter century wasn’t entirely a doom and gloom story. Those who designed the machines did dream of greater flexibility, and a few models appeared (and disappeared) that offered interchangeable typefaces. Some machines, for example, used a drum instead of typebars. This allowed typists to quickly change a typeface, but those models were never produced in significant numbers and the vast majority of typewriters featured permanently fixed type slugs, something that couldn’t be easily replaced. It wasn’t until electro-mechanical and electronic typewriters became the norm that true typeface freedom became a reality for the majority of typewriter buyers. Around 1959 Smith-Corona began to retail its new 6-series portable models, and a few years later, once the new model line had been firmly established, the company introduced what it called Changeable Type. The new feature gave typewriter buyers during the ’60s the opportunity to change, quickly and easily, a few of the special characters that their machines could type. The idea behind Changeable Type was not to swap a typeface, but to provide access to a large library of special characters. It may not have been a revolutionary concept, but it was something not offered at the time by any of the other manufacturers, and for the writers of the hyperbole contained in Smith-Corona ads, Changeable Type was a plausible selling feature. It’s worth mentioning that IBM was already selling its first Selectric model at the time, the game-changing typewriter that used a golf ball element to allow for rapid typeface changes, but Smith-Corona’s Changeable Type machines were marketed toward a different buyer, one who was looking for a portable, and more affordable typewriter than the business-oriented IBM. In practice Changeable Type was easy to use: The type slug was removed by pressing it against the typebar and simultaneously pulling it off. Equally simple was the swapping of its corresponding type key legends that were a part of each specially ordered Changeable Type kit which were sold in single units by Smith-Corona. The Changeable Type library consisted of 91 different ‘snap on’ characters that were sorted into five groups that included: Language Accents and Symbols; Math, Engineering, and Greek Symbols; Medical and Druggist Symbols; Library and Legal Symbols; and Miscellaneous Symbols. It was the Miscellaneous group that contained some of the more unusual and entertaining characters such as unit #73, a type slug that had a sad face (uppercase) and a smiley face (lowercase) emoticon. Changeable Type Unit #69 (don’t laugh) featured gender symbols – “male over female” in Smith-Corona parlance – that are based on the astrological symbols for Mars and Venus (and also used in alchemy for iron and copper). The corresponding key legend cap design was changed a few years after the introduction of Changeable Type which meant there were two different caps available and was important that you ordered the correct one for your particular typewriter. The red caps (left) are the earlier ones, and the black version the updated version. Although most Smith-Corona portables that featured Changeable Type came with two typebars that could accept the special slugs, some models only had one. 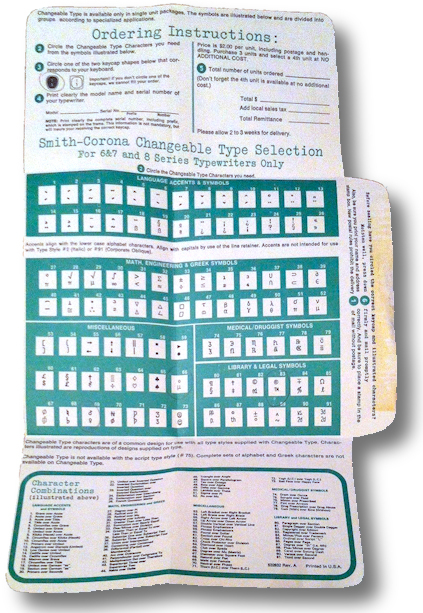 In either case, the optional characters were designed to be used with any of the typefaces that were sold with a Changeable Type equipped model, the exception being they would not work with a script typeface.Students and professionals who needed to use a number of special characters in their written documents would have been the obvious buyers of Changeable Type kits and they were the targets of Smith-Corona ads at the time. However, in the absence of actual sales figures one can only speculate as to how many owners of Smith-Corona portables actually took advantage of the feature. Given that they were reasonably priced ($2 USD including shipping in the early ‘70s, the equivalent of $11 USD today) you would think that the kits would have sold reasonably well, but based on the many dozens of these machines that I’ve examined, most had the standard character set (typically the 1/! and +/= slugs) and it would seem that relatively few kits were sold. One thing is certain: It’s very uncommon fifty years after the introduction of Changeable Type to find these kits being sold individually. It’s also somewhat unusual to find a machine that has any of the optional characters installed, so special characters are something collectors should keep their eyes open for. All of this leads one to wonder if Smith-Corona’s Changeable Type was a success or a failure. 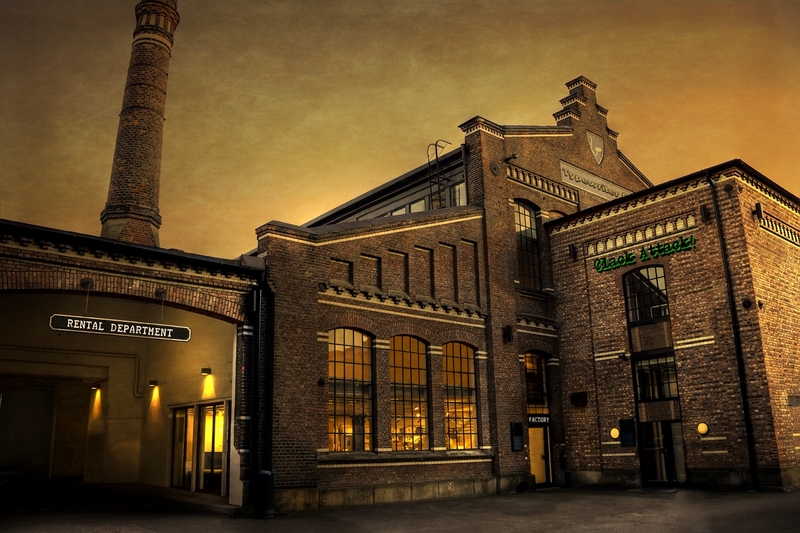 Was Changeable Type an experiment to test the feature for expansion to other model lines? My own theory is that it had arrived too late, and with all the dramatic changes taking place within the typewriter industry during the late ’60s and ’70s, Smith-Corona probably already saw the writing on the wall: just being able to swap a few characters was simply a feature that was too little, and too late. 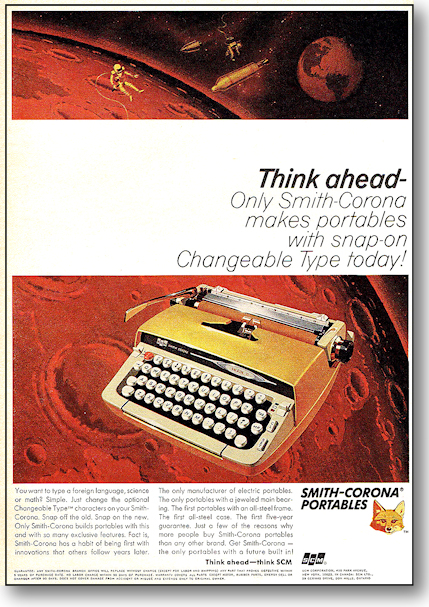 A 1965 Smith-Corona space-age ad for Changeable Type. Apparently Smith-Corona believed its customers would be over the moon with the feature. Mail-in order form for Changeable Type; that’s right kids, a billion years ago snail-mail was actually used to buy things – it worked too.